Jimmy is currently a senior at the Texas Academy of Mathematics and Science in Denton, Texas. Ever since he was young, he has been involved in the fine arts world. He has played both piano and violin and has recently taken up dance as one of his passions. Outside of the arts, Jimmy is pursuing interests in both computer science and business, while also participating in other environmental volunteering activities. In 2017, Jimmy won the President’s Environmental Youth Award, and award given to only one group in each EPA region. In the future, he hopes to be able to combine his skills with his passion for environmental protection so he can create a better world for everyone to live in. Nathaniel is a freshman at Eastman School of Music at University of Rochester. Born in Houston, Texas, Nathaniel displayed exceptional musical talent from an early age. He started to learn piano at 6 and is currently studying piano with Mr. John Weems and Mrs. Nancy Weems. 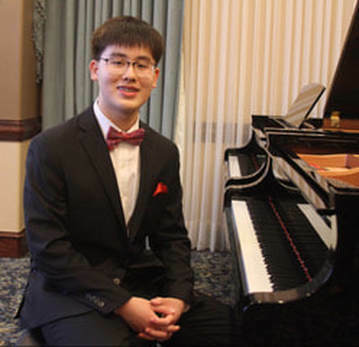 He has won numerous awards that include, 1st place in the solo and concerto divisions of the Carmel Klavier International Piano Competition, 1st place prize in the solo and concerto divisions of the South Texas Piano Competition, the grand prize in the McKinney Young Artist Competition, 1st place prize in the Clear Lake Symphony Piano Concerto Competition. Besides playing piano, Nathaniel is also an academically outstanding student. He enjoys participating in many school activities and is always active for volunteering in the local communities. His dream is enriching others’ lives with the power of music. Bryant Li, 8th Grader in Beckendorff Junior High. He started piano at 6 with Mr. John Weems. Musical accomplishments include: MTNA Piano Competition Texas Junior Piano Division - 2nd Place (2017), Clear Lake Youth Concerto Competition Junior Division-1st (2018, 2016) , Symphony North Young Artist Concerto Competition- 2nd (2017), Baylor/Waco Piano Competition – 1st in 7th~8th Grade (2018), Blinn College Young Pianists Competition -1st in 5th –6th grade & Grand Prize Winner (2016, 2017); Texas State University Young Pianist Competition -1st in 5th~6th grade (2016, 2017); Rochelle Liebling Kahan Memorial Fund Competition for Child Piano Prodigies -1st (2014); Houston Forum for Young Artist Competition at UH- 1st (2013, 2015~ 2017). In addition to being a proud 2016 and 2017 Music Doing Good scholarship recipient, Bryant is also Houston Young Artist (2015-2018). In Mar-2016, Bryant was chosen for NPR’s “From the Top” national recording #321 as the only pianist and youngest performer, and made his first orchestral performance with Clear Lake Symphony. Besides love for music, Bryant is also in highly competitive BDJH science Olympiad team, and math/science team. He wishes to major in both neuroscience and music, and utilize sensation and happiness of music to aid in cure for patients. Grace is a 10th grader at Taylor high school in Katy, Texas. She enjoys spending her free time by helping communities, drawing, dancing and playing the piano. She has been doing lots of communities service in the past several years. She is the vice president of the volunteer group at her school, she is also part of National Charity League. She has won President's Volunteer Service Award in 2016 and 2017. She won Mother-Daughter Award and Medelle Award in 2016. Grace believes that helping those in needs is important and hopes many others will start actively participating in philanthropy events. April is currently an 9th grader at Seven Lakes High School and has been in the top orchestra there for all three years. In fact, she performed at the prestigious Midwest Clinic in late 2015 with the Beckendorff Honor Orchestra. She started playing the violin from a young age, and thoroughly enjoys being able to bring the joy of music to others. Furthermore, she has founded multiple ensembles that perform routinely around the community. At school, she is an academically outstanding student, and she holds many major leadership positions, such as yearbook editor in chief, National Junior Honor Society President, and concertmaster of the Honor Orchestra (for two consecutive years). 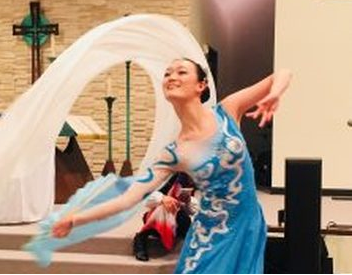 Some of her hobbies include creating artwork, practicing kung fu, volunteering around the community, and reading novels. April believes that through the power of music, we can change the world for the better. © 2018 Music Of Harmony. All rights reserved. Designed by Jimmy Liu, Larry Xue, Grace Liu, and Nathaniel Zhang.